I’ve been interviewing potential trainee solicitors this week which is always fun and interesting – looking at what the future has in store for the next generation. Do try and tailor your cv/application to the firm/position you are applying for. Do put down your correct grades – 3 A levels and an A/S level does not 4 A levels make. If you do not have the requisite grades then obtain relevant work experience. If you’re going to mention the name of the founder of the firm in your application, please get it right – Henry Hodge, Peter Jones and Patrick Allen were the original founders – there was never a Peter Allen in the mix. Do research the firm and the interviewers if you are aware who they may be so that you can ask some interesting questions. Do have extracurricular activities to show you are a rounded human being. It’s all very well being academic, but if you can’t interact with other human beings, we can’t see how you’ll fit in with the team let alone the different types of client that you’ll be expected to put at ease, build a rapport and fight for. Do practise your interview with someone you trust. Someone who will tell you the truth. Of course you need to be prepared but don’t have answers which you’ve learnt off by heart. Do maintain eye contact with those interviewing you. How can we see you representing vulnerable clients if you cannot do that for yourself? Be aware of the world around you; at the very least read a newspaper online. Discuss current affairs with your friends/family. How can you think you’re going to change the world when you’re far removed from it? Have an opinion. Above all be yourself and enjoy the interview; you are interviewing them as well as them interviewing you; you are making a huge commitment and need to be happy where you may end up working. 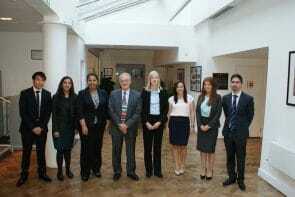 Pictured above: This year’s trainees with Patrick Allen.